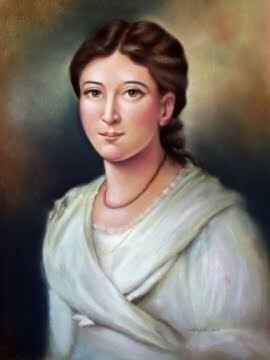 Monday, January 9, 2012 marks the 150th anniversary of the death of Venerable Pauline Marie Jaricot, foundress of The Society for the Propagation of the Faith. Pauline boldly spent her life and her life savings to further the cause of the spread of the Gospel to the ends of the earth. Born into a well to do family in Lyons, France in 1799, Pauline developed into a deep, thoughtful girl during her teen years through tragedy. First, a serious fall caused her to retreat from the world to heal physically. Then, the death of her mother caused great emotional pain for the young girl. Pauline’s prayer life was nurtured at this time by her brother Phileas who was studying to be a priest. Phileas shared stories of the missions of their time with his sister, telling her of the struggle to establish the faith in China and another large mission land of the time, the United States. At the age of 18, Pauline had a prayerful vision: two oil lamps appeared, one empty, one overflowing. The overflowing oil was filling the empty lamp. To Pauline, the empty lamp was her home country of France, still struggling with its faith after the French Revolution. The overflowing lamp represented the young, vibrant faith of the New World whose stories could re-energize Europe. Her vision became her vocation. At just 19 years old, in a time when most women were not even educated, Pauline became “the match that lit the fire” - she organized the workers in her family’s silk mill into “circles of ten”, asking them to gather weekly to pray and sacrifice for mission work around the world. Once established, each circle member was asked to find 10 more people to do the same. Within a year, 500 workers were enrolled; soon there would be thousands. The sacrifices made through Pauline’s circles became the foundation for the Universal Solidarity Fund of The Society for the Propagation of the Faith. No one mission or group is supported – all are. Her vision of the two oil lamps still illuminates our work. Stories of the Church growing around the world continue to inspire Catholics both in the Archdiocese of Boston and worldwide to great prayer and generosity. In 1963, Pope John XXIII signed the decree proclaiming that Pauline lived a life of virtue. The cause for her beatification and canonization continues. Please join us as we pray daily and sacrifice so that the fire that Pauline lit so long ago may continue to burn brightly in Catholics everywhere.